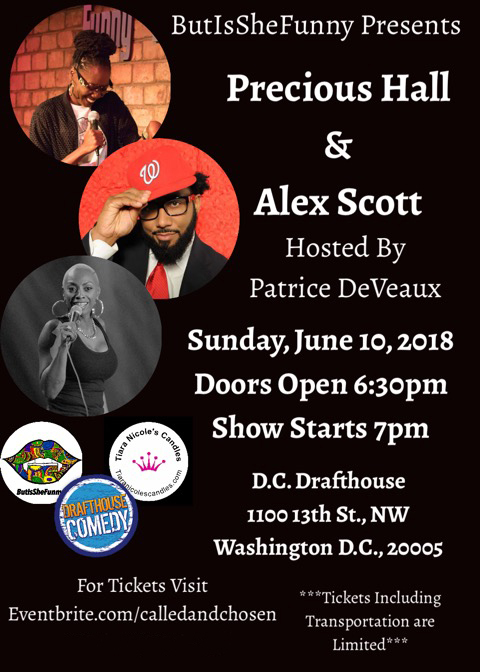 ButIsSheFunny Presents... Called And Chosen Comedy D.C.
ButIsSheFunny Presents Called And Chosen Comedy D.C. Some Of The Best Local And National Comedians Bringing The Riot To The D.C. Draft House Stage. This Comedy Show Also Offers Transportation To/From Richmond, VA To The D.C. Draft House. Featured Performers For This Show Are Precious Hall & Alex Scott. Precious Hall Has A Never Ending Urban Style Of Authentic Comedy. She Made Her Way From Dallas, Texas To Hollywood, California. Precious Is A Regular At The Hollywood Improv, The Comedy Store, & She Is Seen On All-Def-Digital Comedy Channel. Alex Scott Is A Comedy Giant & Verteran. His Very Personal, Gut Punching Style Of Comedy Keeps Crowds Of All Kinds Begging For More. He Has Been Featured On HBO Def Comedy Jam, BET Comic View, The George Lopez Show And Arsenio Hall.